There are several aspects of trading that can put the probabilities in your favor. Many traders are still lured by vendors offering the promise of "90% Winning Trades" or whatever exaggerated flavor of the month being promoted. Traders should come to understand that the one of the most important aspects to learn about trading are the mathematics. If you lose 50% on a trade you don't need to make 50% on your next trade to break-even, you need to make 100%! A system that trades too often can have a higher winning percentage and still under perform a system that trades once a month. When you understand the mathematics and put the probabilities in your favor you have a much greater chance at winning the trading game in the long run. Is there a formula for determining your mathematical probability for success? Yes, there is, it is know as the Average profitability per trade(APPT). APPT measures the average amount a trader can expect to win or lose per trade based on historical trading results. The formula is as follows: Average Profitability Per Trade = (Probability of Win x Average Win) - (Probability of Loss x Average Loss). Take a look at the chart above. This chart represents equity lines for 100 different trading accounts. 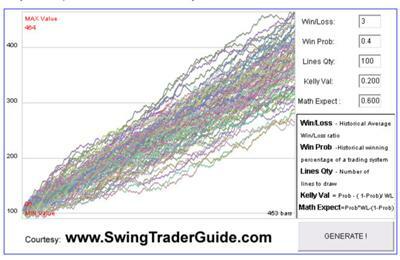 Each account had 453 randomly ordered trades, and each had a 40% winning percentage and a 3:1 win/loss size ratio. As you can see, ALL of the equity lines are in positive territory. This proves that a trading system's winning percentage is not the key but rather the APPT.